Shortly after Edwin proved the existence of other galaxies, he introduced a classification system for galaxies based on their shape. Hubble divided galaxies into three broad classes—ellipticals, lenticulars and spirals, and a fourth class containing all galaxies with irregular appearance. 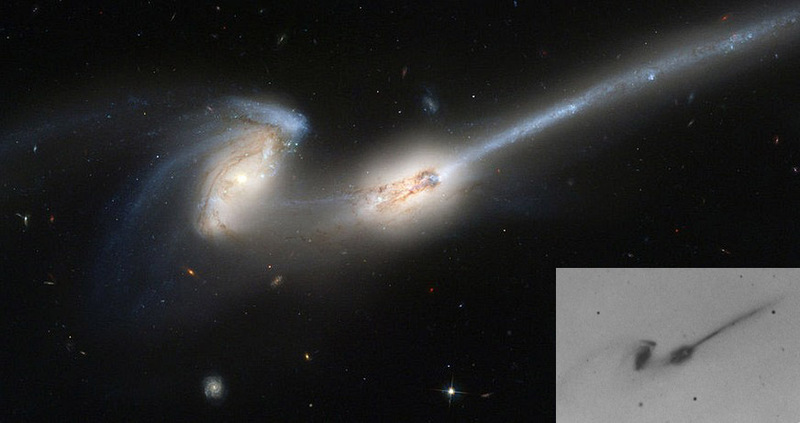 Although Hubble’s scheme is still used to this day, back in the 1960s, American astronomer Halton Arp realized that the system was oversimplified and there was much more variation in a galaxy’s shape than the classification system, known as the Hubble sequence, allows for. To demonstrate his point, in 1966, Arp complied an Atlas of Peculiar Galaxies featuring 338 images of some of the strangest looking galaxies and galaxy groups then known to exist. “Appreciation of these peculiarities is important in order to build a realistic picture of what galaxies are really like,” Arp stated in the preface. 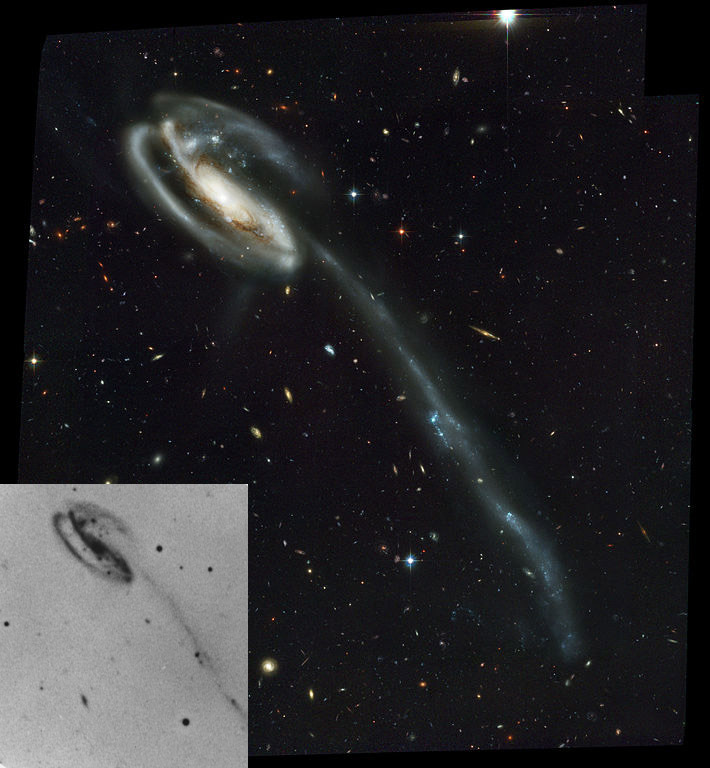 Arp hoped that by studying these peculiar galaxies astronomers would better understand the physical processes behind the formation and evolution of galaxies. “The peculiarities of the galaxies pictured in this Atlas represent perturbations, deformations, and interactions which should enable us to analyze the nature of the real galaxies which we observe and which are too remote to experiment on directly,” Arp wrote. 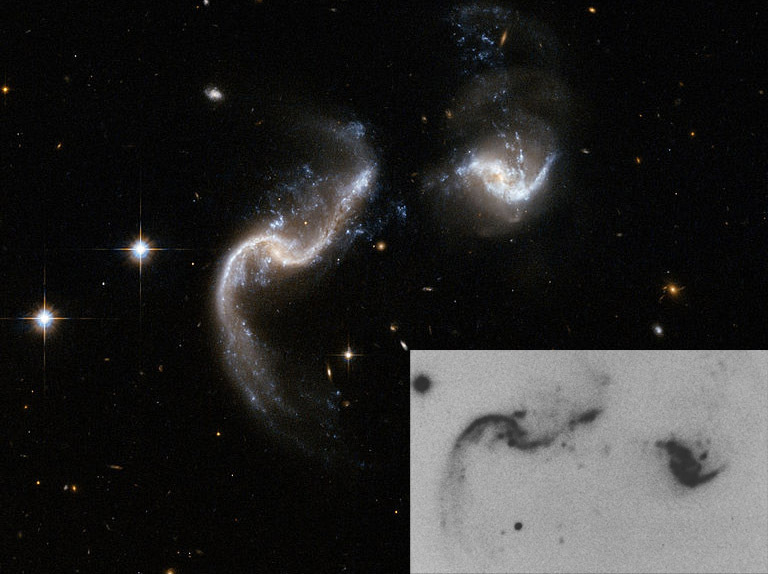 Arp believed these malformed galaxies were examples of ejections, but they were later found to be galaxies crashing into each other and merging together—an idea he strongly disputed. 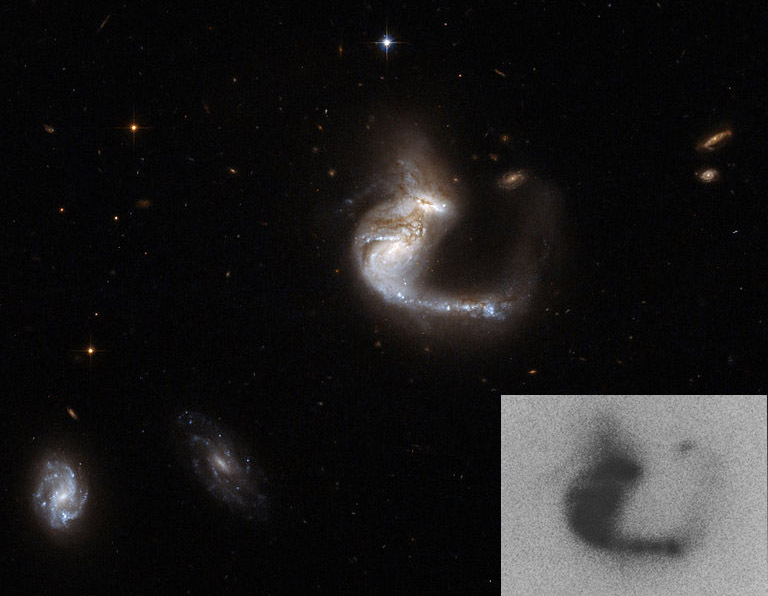 The early images Arp collected using land based telescopes were little more than black blotches on a white background, and very difficult to see what was actually happening. It is understandable why Arp might have thought differently. The following images are recent photographs taken by the Hubble Space Telescope. The inset shows the original photographs as it appeared in the Atlas. 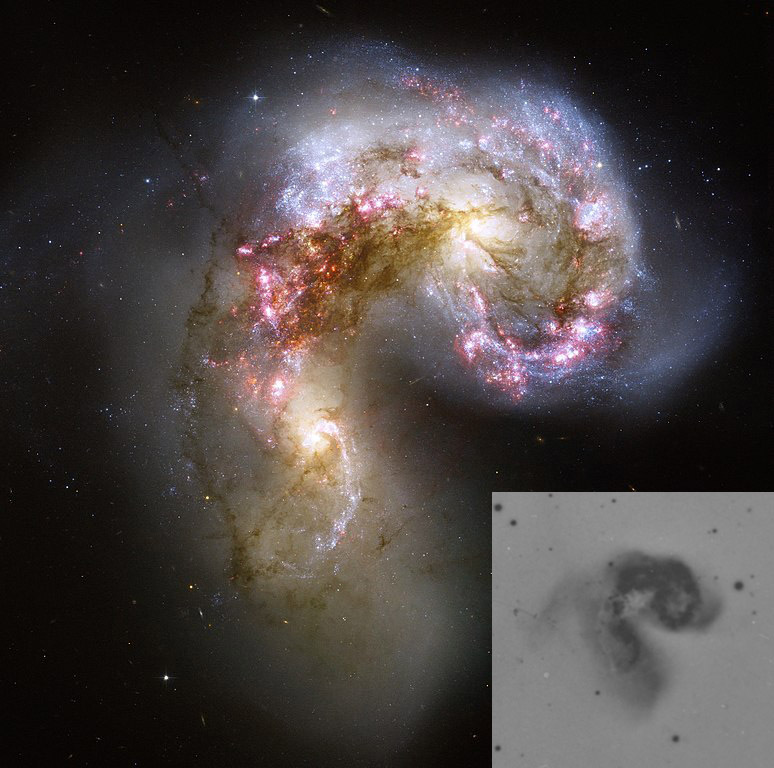 The Antennae galaxies consist of two spiral galaxies that started to merge a few hundred million years ago, making them one of the nearest and youngest examples of a pair of colliding galaxies. The orange blobs to the left and right of image center are the two cores of the original galaxies and consist mainly of old stars. The two galaxies are dotted with brilliant blue star-forming regions surrounded by glowing hydrogen gas, appearing in the image in pink. NGC 6621/2 (Arp 81) is a strongly interacting pair of galaxies, seen about 100 million years after their closest approach. It consists of NGC 6621 (to the right) and NGC 6622 (to the left). The encounter has pulled a long tail out of NGC 6621 that has now wrapped behind its body. The collision has also triggered extensive star formation between the two galaxies. This is the famous Whirlpool galaxy (NGC 5194) interacting with a smaller elliptical galaxy NGC 5195. The interaction has distorted the shape of both galaxies; the spiral arm pattern has been enhanced in the larger spiral galaxy, and a bridge of stars and gas has formed between the two galaxies. The Mice Galaxies (NGC 4676) are two colliding galaxies so named because of the long tails of stars and gas emanating from each galaxy. This image shows the two galaxies, NGC 2936, once a standard spiral galaxy, and NGC 2937, a smaller elliptical galaxy, interacting with each other. The image bears a striking resemblance to a penguin guarding its egg. The Tadpole Galaxy located 420 million light-years from Earth has a massive tail of stars about 280,000 light-years long. It is believed that a smaller intruder galaxy disrupted the former spiral galaxy by passing too close to it and drawing out the spiral galaxy’s stars, gas and dust forming a long conspicuous tail. Arp 147 (also known as IC 298) is an interacting pair of ring galaxies, lying around 440 million light years away from earth. The system was formed when a spiral galaxy (right) collided with an elliptical galaxy (left) producing an expanding wave of star production visible as bright blue light. 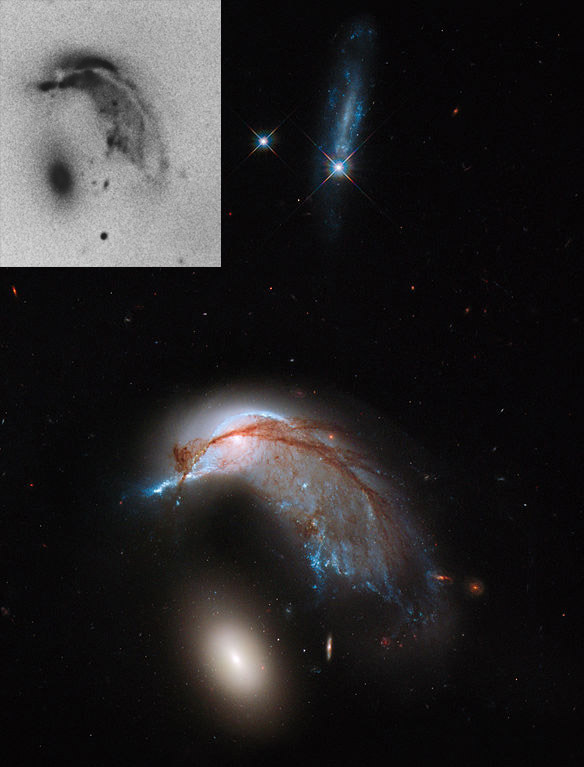 Arp 148 is a stunning example of two colliding galaxies, resulting in a ring-shaped galaxy and a long-tailed companion. 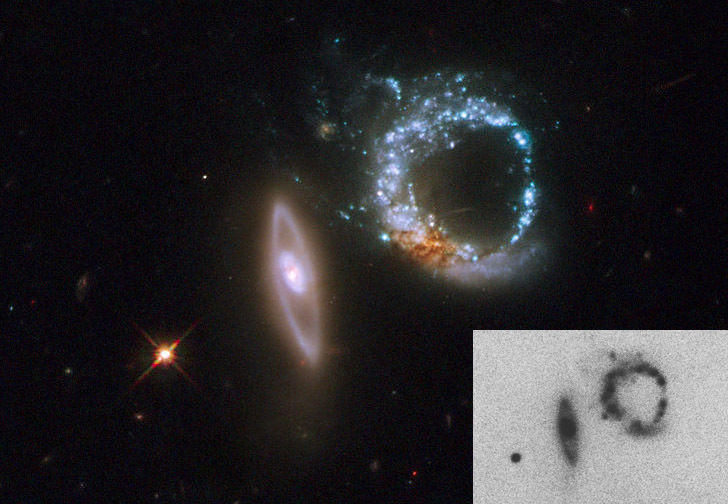 The collision between the two parent galaxies produced a shockwave effect that first drew matter into the center and then caused it to propagate outwards in a ring. 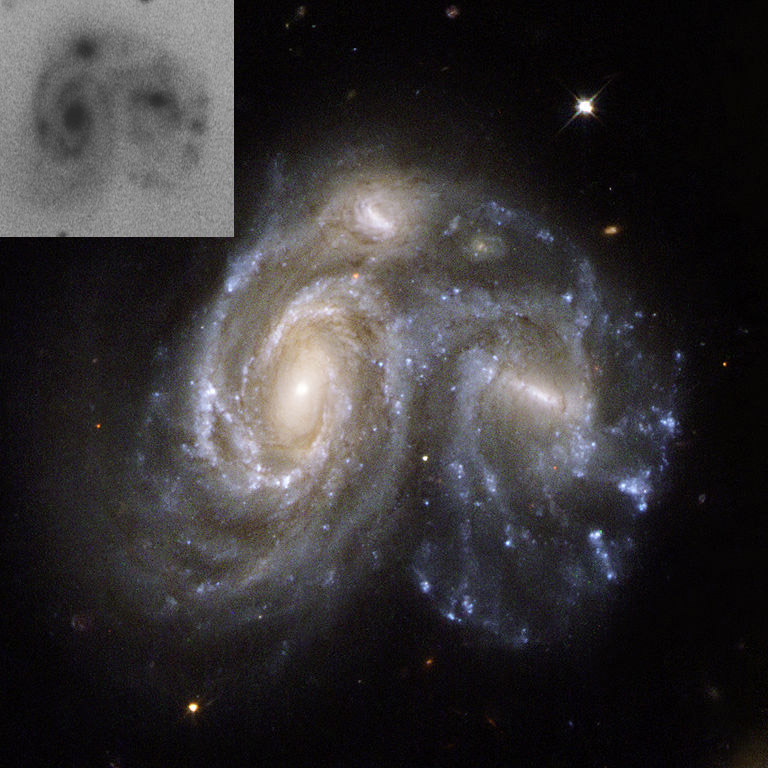 Arp 256 is system of two spiral galaxies in an early stage of merging. A large number of blue knots, seen in the distorted spiral arms, are places of new star formation. 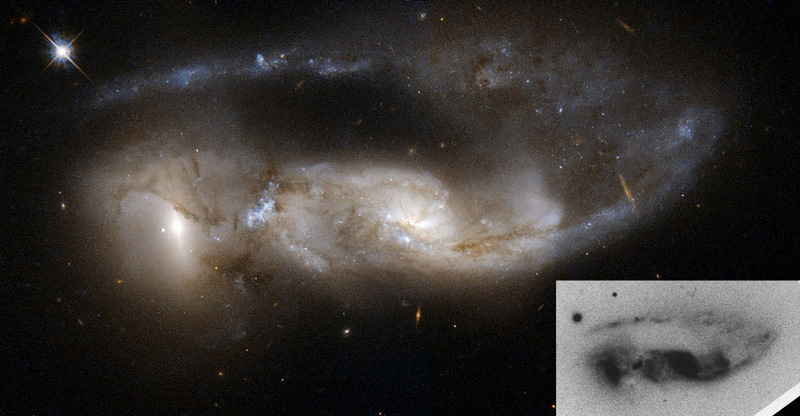 Arp 272 shows a collision between two spiral galaxies, NGC 6050 and IC 1179. 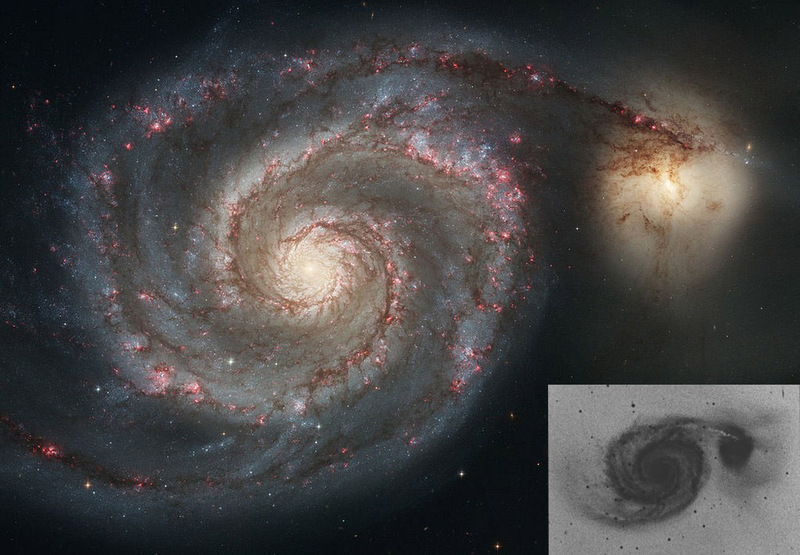 The two spiral galaxies are linked by their swirling arms. 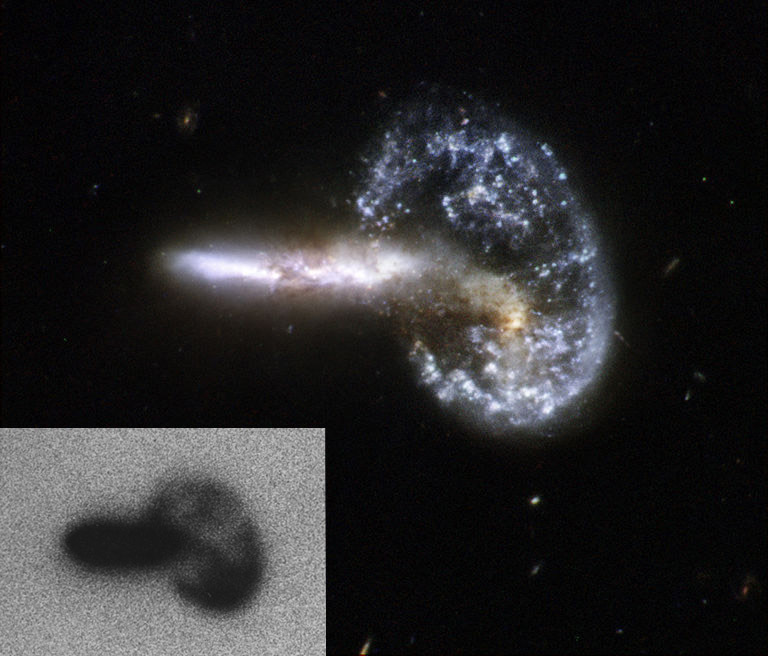 UGC 4881, known as the “The Grasshopper,” is a system consisting of two colliding galaxies. It has a bright curly tail containing a remarkable number of star clusters. The galaxies are thought to be halfway through a merger the cores of the parent galaxies are still clearly separated, but their disks are overlapping. A supernova exploded in this system in 1999 and astronomers believe that a vigorous burst of star formation may have just started.